The Concerto Group is unlike any other hospitality events company currently operating in the UK marketplace. A unique structure enables us to deliver a huge range of services according to any brief. Whether you’re looking for seamless event management, stunning venues, award-winning catering, phenomenal entertainment or trendy bars and restaurants, we can help. 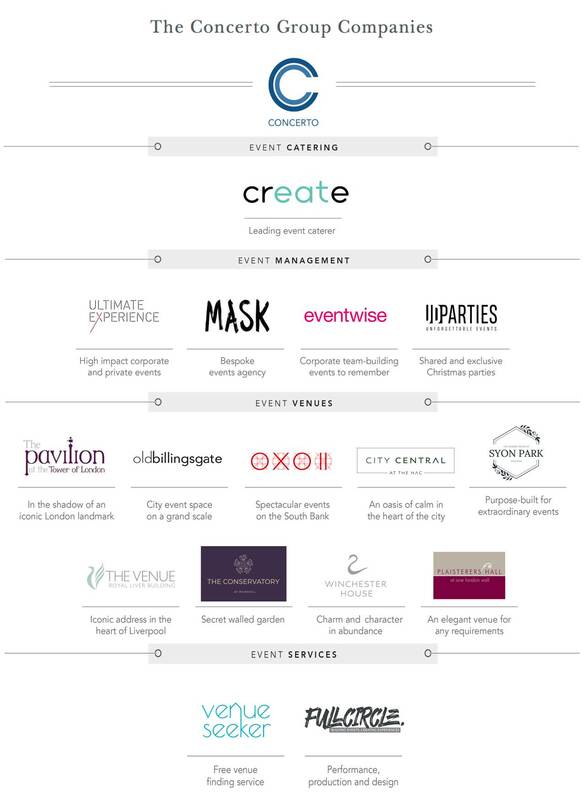 Working with the London events company the Concerto Group couldn’t be simpler. Through one initial point of contact you gain access to an extensive range of event services divisions. Whether you need an award winning caterer, breathtaking entertainment or a venue guaranteed to make guests’ jaws drop, you are in capable hands with The Concerto Group. Our venues include sought-after locations in central London and beyond. Our audiovisual capabilities are unrivalled, whether it’s a full installation, sound system, lighting or production services you’re after. Whatever your requirements, we are here to help with fresh, bold ideas along with attention to detail, professionalism, and flawless delivery. Concerto is now part of CH&Co Group, one of the UK’s most impressive and fast-growing catering and hospitality groups. CH&Co. has a diverse portfolio of specialist businesses providing innovative catering, event and service solutions for business & industry, education, healthcare, inspiring venues and well-known visitor attractions. CH&Co. operates 750 partnerships across the UK and Ireland with a turnover in excess of £300m, employing nearly 6,200 people. CH&Co. also holds a Royal Warrant for catering services to HM The Queen.